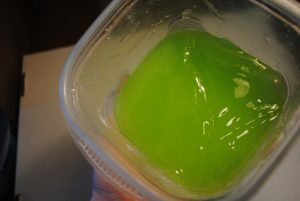 To make the base for slime like this (which isn’t clear like my ectoplasm), I mixed a half cup of water with a bottle of white Elmer’s glue and added five drops of yellow and two drops red food coloring. To finish it (which I sadly don’t have pictures of), I mixed a cup of warm water with a teaspoon of borax and stirred it into my glue mixture. The slime formed much faster than I thought it would. I made a batch of purple as well and mixed them only a little so that the colors would stay separate. Unfortunately, when I got my slime out of the fridge this morning, the colors had muddied together and turned the slime an ugly mottled grey. 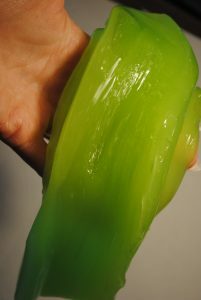 My ectoplasm slime recipe, however, was a success. It almost looks like a bunch of melted jolly ranchers. The second time around I added a tiny bit of white glue as well, and it ended up much better. It reminds me of Ghostbusters! This is definitely my favorite of the slimes I made. The recipes I’ve provided are basic, but you can upgrade your slime by adding glitter or polystyrene beads to give it extra texture. If you want to add glitter, I’d recommend using a color that contrasts with what you already have, such as putting black glitter into the orange slime. Make sure to add the glitter or beads after the food coloring and before the borax. Fill your first bowl with ½ cup of water and a bottle of clear Elmer’s glue. Add in about a teaspoon of white Elmer’s glue. 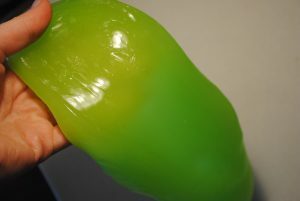 Once the mixture is even and milky-looking, add 1 drop of green food coloring and 2-3 drops of yellow. Stir until the color is even throughout. 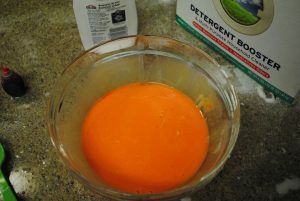 In your second bowl, add 1 cup of warm water and then dissolve a teaspoon of borax in it. Make sure the water is warm – the borax won’t dissolve as well in cold water. Once the borax is dissolved, pour into the bowl with the glue mixture. Stir and watch as the slime congeals. I find that stirring with a chopstick or skewer works best, as they’re easy to clean. 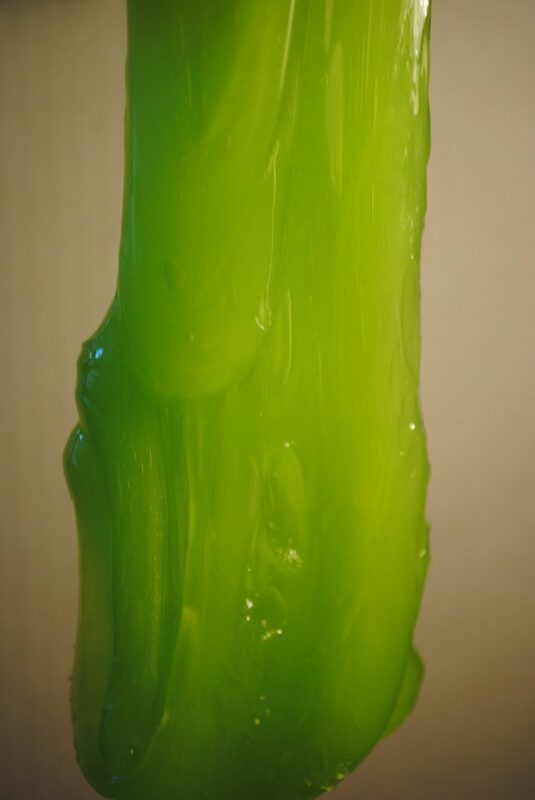 The slime should catch onto your stick. Stir for about 2 minutes. Pick up your slime and pour out any excess liquid in the bowl. 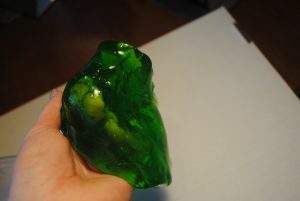 Your ectoplasm slime is done! To store, put in a ziplock or other container and keep in the fridge. If you’d like to try your hand at making the opaque orange slime, the recipe is very similar. 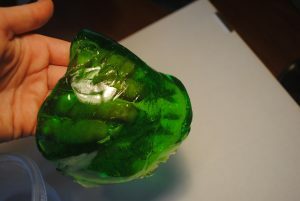 Use the ectoplasm slime recipe, but instead of clear glue, use white Elmer’s glue. For the food coloring, add 5 drops yellow and 2 drops of red.